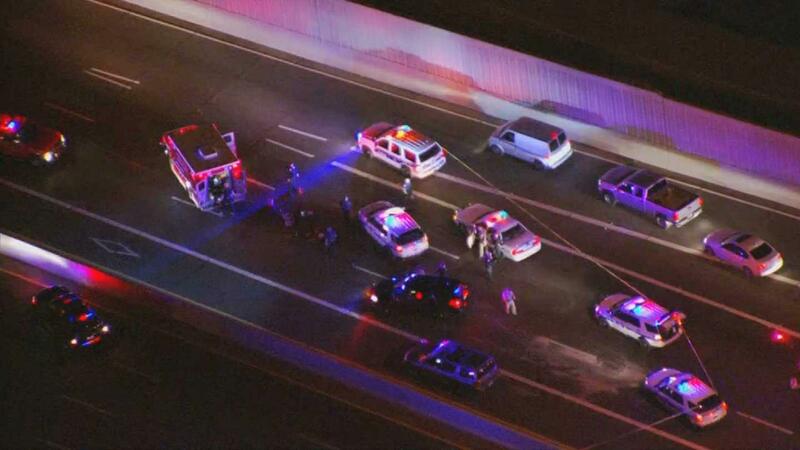 PHOENIX -- A man carjacked a driver at gunpoint in Phoenix then wounded two people after the vehicle crashed on a busy Arizona freeway and he tried to commandeer other cars to get away before he was shot and taken into custody, authorities said. The mayhem on Monday evening forced a nearly 12-hour closure of Interstate 17 - the main road from Phoenix to Flagstaff - as police conducted an investigation. The 31-year-old suspect was hospitalized in serious condition. All the victims were expected to survive, officers said, CBS affiliate KPHO reports. The road finally reopened early Tuesday. Phoenix police spokesman Sgt. Jonathan Howard said it was amazing that more people weren’t hurt, given the gunfire and potential for more traffic collisions. “Things could have been much worse,” he said. Just before 6:30 p.m., Phoenix police were called to help a Department of Public Safety trooper who had stopped for a traffic collision on southbound I-17 between Thomas and Indian School Roads, Phoenix Policed Sgt. Jonathan Howard said. “Troopers quickly learned that the collision involved a shooting and had multiple victims,” Howard said. The suspect pointed a gun at two troopers as they approached while attempting to steal more vehicles, Howard said. The troopers, ages 26 and 35, opened fire and wounded the suspect. The carjacking spree began when the suspect held a 22-year-old man at gunpoint and demanded he drive him to Mexico, police said. “The victim and suspect drove to the I-17 southbound when the two men began to struggle over the gun and the steering wheel,” Howard said. The vehicle collided with the concrete dividers along the freeway at least two times before becoming disabled in the high-speed lane, Howard said. This victim escaped without injury and called police. The suspect then attempted to steal at least three additional vehicles at gunpoint, Howard said. While in the I-17 southbound traffic lanes, the suspect opened the door to a healthcare van carrying two passengers. The suspect struggled with the driver of the van, a 53-year-old man, and shot him before the victim could drive away, Howard said. “This victim was later contacted by police at I-17 and Grant Street, where he stopped for assistance,” Howard said. He was taken to a local hospital with injuries that were not life-threatening. His passengers were not harmed. The suspect then attempted to steal another vehicle at gunpoint, Howard said. A 43-year-old man and his wife were inside. They were able to drive away as the suspect shot at them, Howard said. The vehicle sustained gunshot damage. The couple was not hurt. “The suspect then jumped onto the hood of yet another vehicle being driven by the 21-year-old man and his girlfriend who were involved in the original collision that had drawn the attention of the troopers,” Howard said. With the armed suspect on the hood, the victim drove southbound on I-17. “The suspect shot this victim causing critical injuries,” Howard said. The car collided with the previously disabled vehicle abandoned by the original victim and then collided with the west wall of the freeway, Howard said. The critically injured victim was taken to a local hospital. “As the suspect attempted to steal additional, but unidentified, vehicles now on the northbound I-17, he was confronted by Department of Public Safety troopers,” Howard said. The suspect was pointing his gun at passing motorists and the DPS troopers, according to Howard. “Two troopers shot at the suspect, striking him and ending the assaults,” Howard said. Several other victims contacted police in the area of 2300 W. Bethany Home Road. “It was previously thought that their vehicle had been struck by gunfire but there was no evidence to support this,” Howard said. “It felt like being in a movie,” said Kevin Winchester, a witness. Winchester saw the suspect fire two rounds of shots at one of his victims. “It’s a sad thing we live in a the type of world where there are crazy people like that,” said Winchester. The Phoenix Police Department plans to conduct the criminal investigation into the series of incidents while Department of Public Safety troopers investigate the incident internally. The man, who suffered serious injuries, is expected to be booked on charges related to the shootings and carjacking attempts once he is released from a hospital.